Susana Jiménez, Minister of Energy, and Gloria Hutt, Minister of Transportation, visited the Center for Mathematical Modeling (CMM) of Universidad de Chile framing in a course organized by the Energy Center (CE) of the university. The program seeks to train Transantiago drivers who will be in charge of the electric buses that the Metbus company will implement. “We are addressing the challenges implied in driving electric vehicles,” stated Guillermo Jiménez, director of the CE. 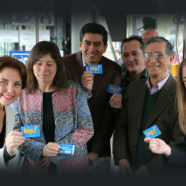 In a first stage, the one hundred buses will cross the corridor Greece in the communes of Ñuñoa and Peñalolén. Then, it will be extended to other sectors of the Metropolitan Region. “The electromobility is here to stay and is the future,” said the Minister of Energy, who announced a bill on energy efficiency in transport that will combine public and private efforts. According to Jorge Amaya, a researcher at the CMM, “the University of Chile has a role in this effort. For several years now, we have been doing state-of-the-art research to have a more efficient and sustainable public transport”. At the end of the visit, the State ministers went down Beauchef Avenue accompanied by researchers from the CMM and the CE. There, they boarded an electric bus stationed at the corner with Tupper Avenue to know its facilities and technology.